Earlier this month, I attended a session on the potential of a Wellington super-city, and was interested to note that the mood, that was so dead set against one in 2010, had begun to shift. In fact, in the previous month, the outgoing chairman of Price Waterhouse Coopers (I can’t bring myself to write that as a single month), John Shewan, presented a session where he outlined the pros and cons. Super-city is in the Zeitgeist for Wellington now, and where the moves have come from, I don’t know. The concerns in Wellington seem to surround the issue of representation, as the popular image of super-city seems to be a tall managerial structure where a super-mayor (God help us if that term is used) sits over earlier structures. I don’t think the Auckland experience has borne this out, but there are definitely concerns over the unfunded community boards, something that Wellington might learn from. Judging by the responses from the session, those for a super-city seem to be around the 40 per cent mark, while those sceptical of one hover around 60—and this is a totally unscientific count. But the fact that proponents have moved from under 5 per cent to around 40 in the middle of Mayor Celia Wade-Brown’s first term is probably heartening for the super-camp, who might wish to extrapolate it heading further north come 2013. Our table seemed to be more pro- than anti-, and we were the last to report in. I was asked to speak on the table’s behalf and I noted to Garry Poole, CEO of the Wellington City Council, that if there was one thing worse than coming third, it was coming last. However, the efficiency argument held some sway among our participants, and that Auckland itself, according to John’s figures, was forecast to make some real savings in administration. The present system, it might be argued, is flawed anyway (what system isn’t?) 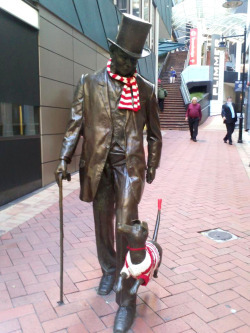 so should we really wait till Wellington is in crisis mode before we consider change? I did add one note about the efficiency argument, perhaps lost on the audience. I pointed out that Slater Walker, the corporate raiders in Britain of the 1960s, got away with a lot because of the same argument—that its actions were necessary for the efficiency of British industry. As it turned out, it led to the demise of British industry (if I were to generalize). But, as long as we were talking about true efficiencies forced into being through legislation—for getting two councils on to the same software system is hard enough without a concerted effort—then that might be a good thing for ratepayers. The popular image of the super-structure might not be that relevant, and this is where technology could serve us for a change. Representation is the biggest concern of those who are against the super-city, so why not adopt technological measures, such as capturing ideas and intel electronically from around the Wellington region, so they can be used by the council? (As in 2010, I maintain that 130,000 voters are far smarter collectively than a single council.) Flatten the structure so mayor and council can hear the concerns of citizens—and keep it flattened, just as we were taught at business school. If Auckland’s biggest mistake was in community board funding, is it possible to investigate how they can remain funded properly here? There are way too many issues to discuss in a single blog post, but I’m just ﬂagging some for discussion. What are your feelings out there? Is the mood shifting? Can I stop preﬁxing words with super-?